Within the Province of KwaZulu-Natal, in South Africa, eThekwini Municipality intends to implement a Project aimed at eradicating the House Crow (Corvus splendens) from its jurisdiction. In terms of the National Environmental Management: Biodiversity Act (NEMBA), Act 10 of 2004, the species is listed as a Category 1a under the Invasive Alien Species (IAS) Regulations gazetted in July 2014 and as such requires immediate eradication efforts. The species belongs to a cosmopolitan family Corvidae, which has well over 120 species including oscine passerine birds such as crows, ravens, magpies, rooks, treepies etc. In line with legislation, eThekwini Municipality has implemented a number of large-scale programmes and projects aimed at controlling invasive alien species. In achieving this, the municipality has a strong belief in forming partnerships with relevant stakeholders, including academic institutions, neighboring municipalities, conservation authorities, conservancies, non-profit organizations, the private sector, provincial and national government departments etc. The House Crow (Corvus splendens) belong to the family Corvidae, which is a cosmopolitan family enriched with well over 120 species, comprising of birds that display remarkable levels of intelligence for their size and are among the most intelligent birds studied thus far . Birds in this family include crows, ravens, magpies, treepies, rooks, jackdaws, choughs and nutcrackers [2,3]. Although it is known that Corvus splendens consisted of five subspecies (Corvus s. splendens, C. s. zugmayeri, C. s. protegatus, C. s. maledivicus, and C. s. insolens), in South Africa it is called Corvus splendens because of lack genetic study as to determine which subspecies they might belong to [4,5]. Their native origin is from South-Iran and Pakistan up to Burma and North to Nepal and south up to Sri Lanka . The species is known to occur in approximately 25 countries in which it is establishing . It was introduced in Zanzibar around 1900, where they spread to Kenya in 1947, more especially in the coastal areas between Mombasa and Malindi [8,9]. Its expansion has increased whilst leaving behind serious negative impacts and devastations to indigenous biodiversity [8-10]. Only when a large number of crows occurs outside its native distribution not only it creates devastations for biodiversity, it also has negative impacts on human health, affects tourism, negatively impacts infrastructure as well as general developments . The species has shown a rapid expansion of its invaded range across Australia, Eastern Africa, the Arabian Peninsula, Europe and USA [10,11-13]. In Ismailia Governorate alone, the population of House Crow has increased from 6000 per annum to 10,909 birds . It is considered one of the world’s most invasive bird species affecting well in access of 25 nations throughout the Indian Ocean, Arabian Peninsula and South East Asia . According to Fraser et al. the species is highly adaptable to varying environments, is also a gregarious commensal bird which is regarded as a pest of great concern due to its impacts on livestock, agricultural and horticultural crops, indigenous fauna as well as a faecal contaminator of human environments and water resources . Whilst highly associated with human habitation, the species is greatly found around dumpsites, more especially in the areas with less hygiene [11,14-17]. The reason the House Crow is considered a serious agricultural pest is that it feeds on a range of crops, mainly maize and has been observed attacking and even killing small livestock and poultry [18-21]. The species only live in close association with humans in urban/ semi-urban areas and is not known to live independently from humans [22,23]. The bird is highly competitive amongst other birds, where it will quickly outcompete and displace indigenous bird species through predation or through persistent attacks and mobbing for nesting sites by destroying eggs and nests of those birds [8,24,25]. Since the House Crow is highly affiliated with human habitation, the most likely point of entry and establishment is around major ports such as airport and ship, as has been the case in other countries like New Zealand, Yemen, Malaysia and the Netherlands [7,17,25]. Although, Cooper found nothing when examining House Crows in Tanzania, this bird have been identified as carriers of human enteric disease organisms such as Salmonella spp., Shigella serotypes, Proteus spp., Vibrioaceae spp., Pseudomonas spp., Escherichia coli, Campylobacter spp., Newcastle disease and the potential for spread of bird flu . House Crows are thus considered a major concern to human health, throughout their range, mainly due to their abundance in villages, towns and cities where they also create considerable noise pollution [24-29]. Globally, the House Crow is regarded as an important pest species with significant potential for further global invasion [11,14,23]. In South Africa, at the beginning of 2018, eThekwini Municipality re-implemented the Monitoring, Surveillance and Eradication (MSE) of the House Crow (Corvus splendens) within its area of jurisdiction (Table 1). The MSE is a long-standing project that needs to continue as it was previously implemented and managed by the municipality (2009-2013) and later by the National Department of Environmental Affairs’ Environmental Programmes branch (2013-2015). Previous intervention methods had drastically reduced House Crow numbers, but the populations began multiplying again and there is a high risk of the species dispersing further into other coastal areas of KwaZulu-Natal Province and other South African parts, if not adequately controlled . Note: * Formally known as uThungulu District Municipality. Table 1: Preliminary location of where populations of invasive House Crows (Corvus splendens) have been spotted in three municipalities (eThekwini Municipality; uMgungundlovu District Municipality & King Cetshwayo District Municipality), in the KwaZulu-Natal Province, during 2007, 2008, and 2018. Currently, there are only three known populations of House Crows in South Africa, namely at eSikhaweni (near Richards Bay), Durban and Cape Town. In Durban, the species has been reported in areas near to and/or south of the City’s CBD (Central Business District) specifically in the harbour, Merebank and Jacobs. Without proper control, these small populations can rapidly recover to alarming numbers and at that time the management would require significant financial and other resources. Failure to carry out the required control may result in the birds becoming permanent residents in eThekwini Municipality and also spreading onto to other areas around the municipality. Needless to say, this will have many negative consequences on both biodiversity and the economy of the country. Large populations of House Crows self-introduced in neighboring Mozambique and on Inhaca Island and pose a threat to South Africa, as House Crows have previously been introduced to Richards Bay, Durban and Cape Town as stowaways on ships entering through the ports and harbours. The potential of House Crows occurring in future may be high and such migrant individuals may establish new populations throughout South Africa. With unregulated developments and invasive alien species posing significant threats to indigenous biodiversity, at the Rio Earth Summit in 1992, the United Nations agreed that the best starting point for sustainable development is at the local level. Based on this agreement, the Local Agenda 21 concept was born. The Local Agenda 21 provides local decision-making for Integrated Development Plans (IDPs) have to be based on the goal of achieving social, economic and environmental sustainability. For South Africa, post-1994 (democratically elected government); there came opportunities for accessing international funds for conservation action in globally significant nodes to fulfill both constitutional and international obligations in safeguarding indigenous biodiversity. This stresses and highlights the fact that the biodiversity we have, is not only for us but is of great value even to the international community and hence the need to protect it. In South Africa, Corvids birds such as Pied Crows (Corvus albus) and Cape Crows (Corvus capensis); Kites (family Accipitridae), Kestrels (family Falconidae), raptors, chickens and many other small indigenous birds like doves, finches etc., are all threatened by House Crows. Furthermore, since House Crows also feed on chicks, eggs, insects, fish, frogs, lizards, rodents and other small mammals, their population is most likely to have negative effects on nocturnal birds like owls that feed on some of the same prey predated by House Crows . With pressures exerted by House Crows on various prey species, even some migratory bird species can easily be affected by increase in House Crow populations. Alien invasive species, including House Crows, have huge, negative ecological and economic impacts [21,32,33]. It is sadly our inability to effectively manage invasions, due to a number of factors including lack of management tools, resources, coordination efforts as well as economic and political constraints, which often worsen the situation . The immediate reaction to invasions, in light of limited resources and strict constraints, is always a better option for resource managers with limited funds . The aims of this work were to 1) implement measures to eradicate invasive House Crows establishing in eThekwini municipality, Durban, South Africa and 2) encourage neighboring local authorities and provincially to take part and control House Crows (and other alien invasive species) within their jurisdictions. A coordinated effort is essential if we are to have an impact in these invasive alien species. For about three months, eThekwini Municipality intends to conduct a survey of the behavior and distribution of House Crows within the municipality. Information will be collated from various sources, including the general public and submitted to the service provider appointed to control the species. Through this process sites, where crows have been seen, will then be confirmed. A database will thus be created and this will serve as the basis for sites frequented by House Crows and the control operation will then resume. However, for now, a few sites have been confirmed in some areas such as Merebank, the Harbour (south of CBD) and at Jacobs, near the Bluff (Figure 1). The survey will help establish if there are any other sites within eThekwini Municipality. 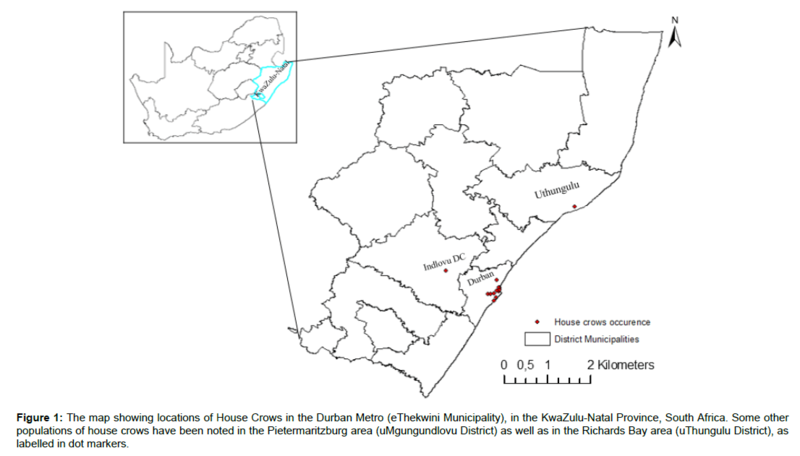 Figure 1: The map showing locations of House Crows in the Durban Metro (eThekwini Municipality), in the KwaZulu-Natal Province, South Africa. Some other populations of house crows have been noted in the Pietermaritzburg area (uMgungundlovu District) as well as in the Richards Bay area (uThungulu District), as labelled in dot markers. Awareness material in the form of an information flyer, as well as the word of mouth which will be communicated at every relevant Forum, will serve to spread the word on which species specifically is being controlled and why. The flyer has pictures of potential birds that might be confused with House Crows because House Crows may easily be confused with native crows. Additional information on House Crow impacts on indigenous biodiversity as well as human health risks linked to House Crows, was drafted and communicated to relevant stakeholders like eThekwini Conservancies; Durban SPCA (Society for the Prevention of Cruelty to Animals); Provincial CROW (Centre for Rehabilitation of Wildlife); neighbouring Municipalities; National Department of Environmental Affairs (DEA); Provincial Endangered Wildlife Trust (EWT); Ezemvelo KZN Wildlife (EKZNW), etc. This engagement phase serves to create broad awareness on the initiative of House Crow control, within eThekwini Municipality, but also to try and not only seek partnerships but also to prompt neighboring municipalities and the Province at large, to initiate complementary projects in other municipalities. This will help increase the chances of eradicating House Crows but it will also help in strengthening collaborative environmental management between municipalities, otherwise, the project might be all in vain. Sample collection for DNA analysis (in collaboration with the University of KwaZulu-Natal). Publishing this material at the onset was imperative in order to encourage other local authorities (bioregions), to control invasive species within their municipality. The control measure such as eradication of House Crows was feasible in countries such as Socotra Island, Singapore, Mauritius and recently in the Netherlands with aid of public [10,11,36,37]. This has helped to reduce the number of House Crows established [10,11]. This article intends to create awareness about what eThekwini Municipality is doing to control the House Crows, to indicate methods of control that will be implemented and to plead with neighboring municipalities to initiate similar projects to complement the work done in eThekwini Municipality. In a year or two, collaboration with any stakeholders who initiate a similar project could be looked at in publishing results and achievements and the Environmental Planning and Climate Protection Department of eThekwini Municipality strongly encourages this. In as much as House Crows are creatures of habit, they are very mobile when necessary to evade danger and a collaborative project across the Province, if not the country, is a key to successful control project. A coordinated approach to achieving this, across both the Province and the country, is needed otherwise House Crows will keep repopulating areas that have been controlled or simply seeking refuge in areas where there is no active control. Section 4 of Chapter 3 of the Constitution of the Republic of South Africa (Act No. 108 of 1996), requires that “all government spheres and all organs of state must consult and inform one another on matters of common interest and coordinate their actions and legislation with one another”. This article serves to do and to encourage just that because indigenous biodiversity is a matter of common interest. Industries such as ecotourism (biodiversity-driven) and agriculture, as well as the unsung role played by biodiversity in the production of ecosystem services, all play a critical role and also form the cornerstone of the South African economy and therefore the safeguarding of these from the impacts of invasive alien species is fundamental to the maintenance of the country’s economic and social well-being [17,38,39]. We would like to thank the Environmental Planning and Climate Protection Department of eThekwini Municipality for providing the platform for this work. We would also like to thank Sanele Mchunu and Nomzamo Mncube who assisted with the compilation of a Flyer for the control of House Crows in eThekwini Municipality as well as for their assistance with the Strategic Planning Workshop on Public Engagement for the Control of House Crows in eThekwini Municipality, which was held on the 31st of May 2018, at Burman Bush, Durban. Prior H, Schwarz A, Güntürkün O (2008) Mirror-induced behaviour in the Magpie (Pica pica): Evidence of self-recognition. PLoS Biol 6: 202. Robertson D (2000) Bird Families of the World: Corvidae. Clayton N, Emery N (2005) Corvid cognition. Curr Biol 15: 80-81. Madge S, Burn H (1994) A guide to the crows, jays & magpies of the world. Crows & Jays, Christopher Helm, London, UK. Ottens G (2003) Background and development of the Dutch population House Crows (Corvus Splendens). Limosa 76: 69-74. Ali S (2002) The book of Indian birds. 13th edn. Oxford University Press, New Delhi, India. Suliman AS, Meier GG, Haverson PJ (2011) Eradication of the House Crow from Socotra Island, Yemen. Island Invasive: Eradication and Management, IUCN, Gland, Switzerland. Ryall C (1992) Predation and harassment of native bird species by the Indian House Crow (Corvus Splendens) in Mombasa, Kenya. Scopus 16: 1-8. Ryall C, Reid C (1987) The Indian house crow in Mombasa. Swara 10: 9-12. Kamel AM (2014) Potential impacts of invasive house crows (Corvus splendens) bird species in Ismailia Governorate, Egypt: Ecology, control and risk management. J Life Sci Technol 2: 86-89. Brook BW, Sodhi NS, Soh MC, Lim HC (2003) Abundance and projected control of invasive house crows in Singapore. J Wildl Manage 67: 808-817. Ryall C (2002) Further records of range extension in the House Crow (Corvus splendens). Bulletin of British Ornithologists Club 122: 231-240. State of Queensland (2016) Indian House Crow. Fraser DL, Aguilar G, Nagle W, Galbraith M, Ryall C (2015) The House Crow (Corvus Splendens): A threat to New Zealand? ISPRS Int J Geoinf 4: 725-740. Vertebrate Pest Committee (VPC) (2007) List of exotic vertebrate animals in Australia. VPC, Australia. Koul S, Sahi DN (2013) Feeding ecology of House Crow (Corvus Splendens) in open agricultural fields in Jammu (J&K), India. Int Res J Environ Sci 2: 85-87. Ryall C, Meier GG (2008) House Crow in the Middle East. Wildlife Middle East News 3: 8237-1990. Bhardwaj TK (1991) Damage patterns of House Crow (Corvus Splendens) to maize and wheat in some farmlands in Indian Punjab. Trop Pest Manage 37: 144-119. Dhindsa KK, Ghazi NK, Tribasti P (1991) Damage proportions to sprouting sunflowers. Trop Pest Manage 37: 1607-1612. Ali H (2008) Behaviour and ecology of the House Crow (Corvus Splendens) in Islamabad-Rawalpindi and Adjoining areas. University of Agriculture, Faisalabad, Pakistan. Akram N, Khan HA, Javed M (2013) Inhibiting the House Crow (Corvus Splendens) damage on maize growth stages with reflecting ribbons in a farmland. J Anim Plant Sci 23: 182-189. Lim HC, Sodhi NS, Brook BW, Soh MC (2003) Undesirable aliens: Factors determining the distribution of three invasive bird species in Singapore. J Trop Ecol 19: 685-695. Nyari A, Ryall C, Townsend PA (2006) Global invasive potential of the House Crow (Corvus Splendens) based on ecological niche modelling. J Avian Biol 4: 306-311. Al-Sallami S (1991) A possible role of crows in the spread of diarrhoeal diseases in Aden. J Egypt Public Health Assoc 66: 441-449. Ryall C (2003) Notes on ecology and behaviour of house crows at Hoek van Holland. Dutch Bird 25: 167-172.
Cooper JE (1996) Health studies on the Indian House Crow (Corvus Splendens). Avian Pathol 25: 381-386. Roy P, Venugopalan AT, Manvell R (1998) Isolation of newcastle disease virus from an Indian House Crow. Trop Anim Health Prod 30: 177-178. Peh KSH, Sodhi NS (2002) Characteristics of nocturnal characteristics roosts of House Crows. J Wildl Manage 66: 1128-1133. Reddy VR (1998) Bird damage to maize crop on the student’s research farm at Rajendranagar, Hyderabad, Andhra Pradesh. Pavo 36: 77-78. Allan DG, Davies GB (2005) Breeding biology of House Crows (Corvus Splendens) in Durban, South Africa. Ostrich 76: 21-31. Khan HA (2002) Damage patterns of House Crow (Corvus Splendens) on some food crops in Faisalabad. Int J Agri Biol 2: 500-502. Pimentel D, Zuniga R, Morrison D (2005) Update on the environmental and economic costs associated with alien-invasive species in the United States. Ecol Econ 52: 273-288. Hobbs RJ, Humphries SE (1995) An integrated approach to the ecology and management of plant invasions. Conserv Biol 9: 761-770. Larson DL, Phillips-Mao L, Quiram G, Sharpe L, Stark R, et al. (2011) A framework for sustainable invasive species management: Environmental, social, and economic objectives. J Environ Manage 92:14-22. Puttoo M, Archer T (2004) Control and/or eradication of Indian Crows (Corvus Splendens) in Mauritius. Food and Agricultural Research Council, Mauritius 83: 299-309. Vane M, Runhaar HA (2016) Public support for invasive alien species eradication programs: Insights from the Netherlands. Restor Ecol 24: 743-748. Ryall C (2010) Further records and updates of range extension in House Crow (Corvus Splendens). Bull Br Ornithol Club 130: 246-254. Xavier R, Komendantova N, Jarbandhan V, Nel D (2017) Participatory governance in the transformation of the South African energy sector: Critical success factors for environmental. J Cleaner Prod 154: 621-632.